[ Sign Up ] Keep Me Posted! Sadness welled up, triggered by simple lyrics, a song about life after the passing of his love. Only this sadness didn’t felt like mine. I am living a blessed life. After several weeks, when this sadness still surfaced with the song during random plays, determined to release this emotion, I decided to face it head-on, brutal force style. The morning of a day with nothing scheduled, I put on my headphone, set to loop just this one song, took a deep breath, and braced for what’s coming. I want to watch you leave, follow behind you wondering the streets. I’m waiting for you to turn and look at me then decide to stay eventually. The tears came. I was watching a little boy and I was the little boy. He was peeking through a slit in a shabby wooden door as his father walked away from the lens maker’s work shed. I want to take your little hand and say let’s go home. I was crying now. The sorrow was deep yet without a solid root in me. The boy was almost sure his father would change his mind the very next moment and take him home. A father who marked his anger all over his little boy’s body and heart. A father who hated his son for taking his wife’s life during the childbirth. “I love you. Whenever you need a hug, think of me, you will feel me here with you.” I let him cried a little longer. He was dying and I was keeping him company. He was forced into the army, now wounded and bleeding to death on the battle field. I held him and said “You can let go now, you’ve done your best.” After he left his body, I sent my gratitude along. The scenes I described did not appeared to me visually. I only sensed the events happening. I’ve made peace with not being able to “see” as many intuitive people can. I only knew about this past life from a session with Ainslie MacLeod. Though this felt like real-time, I was not “reliving” that life as many people experience in the past life regressions. As I was writing the drafts of this post, the sadness still returned when I read the lyrics. A friend then offered to use ETF (Emotional Freedom Techniques or tapping) to release this past life trauma. When she was done, she mentioned it was easier than expected and that I must have processed a lot of it already. I guess my Brutal Force Style healing did work, just not as fast. Later, I tested it again on my own by reading the lyrics and listening to the song and the same emotion did not return. Posted in Healing Tools, I Learned This	| Tagged Ainslie MacLeod, EFT, past life trauma, soul healing	| Comment? 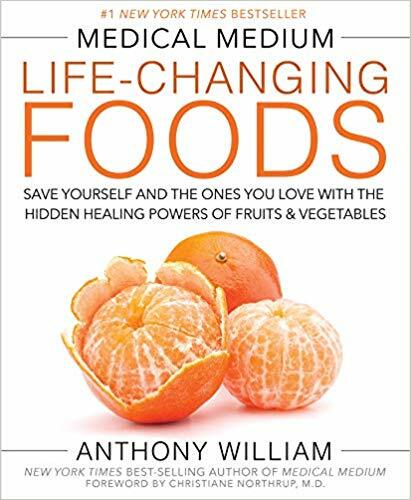 Once I understood that “Small Annoyances Must Die!“, I cut wheat, dairy, and eggs (was already off corn for the Round-Up gene contamination) as suggested by Anthony William in Life-Changing Foods to stop many little health issues along with other healing methods I will be writing about in the future. That left me with rice being the main option to replace wheat. In my search for options, I was surprise how hard it is to find vegan + gluten-free + organic options in my local natural food market. Besides that, many gluten-free breads and gluten-free mixes contains ingredients that I want to avoid (corn based additives, xanthan gum, sugar, modified cellulose, certain oils, etc. ), some because of the health implications, some because I just want simple, basic ingredients. Let’s face it, rice will never taste like wheat. Just get over it and stop judging rice bake goods as the wheat ones. We have already done so much harm to our bodies faking sugar, meat, butter, and many more. To have a say in what’s in my food, I ended up spending much more time in the kitchen. Stir-fry, curry, and many Asian dishes are perfect to go with rice. But I still need some bake goods for when I am short on time. By luck, I caught Medical Frontiers Special – Search for Superfoods in Niigata on NHK World. In the last segment, rice flour baking expert, Sakumi Tamori showed us 3 rice based baking recipes. I’ve only baked the cookies and the scones so far. I first tried to make my own rice flour but my little Vitamix S50 wasn’t powerful enough, and my cookies turned out a bit grainy. So I switched to Bob’s Red Mill Organic White Rice Flour. The cookies also were too hard for me, I swapped out some potato starch with tapioca flour and added some baking powder. And to save time, I scooped my dough into little domes, rolling and cutting was too messy as well. For the scones, my savory version uses sweet potato in place of the banana and added my grounded herb mix (also per Anthony‘s suggestions), chopped onion, garlic, green onion, and jalapeño. I then freeze them for when I don’t have time to cook. I also use local raw honey instead of sugar in both recipes. As for the rice oil suggested in the video, I use refined sesame oil (445F smoking point) since I am not sure if what we can get in the States are the same thing as the Japanese ones. I understand that majority of people don’t have the luxury to cook all the time. Anthony mentioned just do your best to cut down on the ingredients that are not good for you. I cheat when I am super hungry/busy/lazy but I do try to pick the best options from the deli of my local natural food store. After all, we do die sooner from hunger than from a little unhelpful food. Posted in I Learned This	| Tagged Anthony William, baking, gluten-free, Japan, life-changing food, medical frontiers superfoods, NHK World, rice flour, vegan	| Comment? Fine, it may sound over the top but they were slowly killing my spirit and taking my health with it. One day some years ago, I snapped at a family member, it was the wake-up call telling me that I was no longer my happy self. The stress of dealing with details from work and from taking care of people and things had got to me. Luckly, even though I was struggling, I had enough energy left to fight back hard. I changed how I work, Konmari-cleaned my room, and did my best not to push myself too hard. Still, I was tired, irritable, extremely indecisive, plus, feeling stuck, alone, and helpless. All signs pointed to depression. If fixing big things didn’t finished the job, what else was draining my energy and joy? Then I remembered why Konmari method works. The process helped me remove the noises in my environment and inefficiency in my everyday tasks. When I was done, not only I ended up with a space I want, I am saving time, energy, and grief every time I reach for something I need. Once I realized this, I observed how I move through the day, a major pattern emerged. I was constantly stopping to clear my nose and throat, an issue I had lived with for a long time. Though the respiratory congestion was never severe enough to see a doctor, once I noticed that I could not un-see how it consumed my life. Since then I have been working to cure it and I will be sharing my experiences in future posts. In the process, I am also solving other little things that annoy me, something simple like replacing heavy pans with lighter ones for easy cleaning and handling. Living with small annoyances is like being in the stop-and-go traffic. It demands your constant attention (induces fatigue). It is a danger to your life (brings on road rage, increases chance of accidents). If you do it everyday then it turns into a chronic, sometimes permanent, mental and physical illnesses. Posted in I Learned This, Tips for Daily Life	| Tagged cause, depression, healing, illness, stress	| Comment? I am assuming you are here because you have read the course description for the latest “The Power of Eight Intention Masterclass” and want to know what it would be like before you sign up. If you have not, Lynne teaches this online course every year and she updates the contents with her growing knowledge and experiences. So instead of linking you to the class page, visit Lynne’s site, signup for the newsletter or watch for early-bird discount near the end of the year. Before you go on, please keep in mind these are my own experiences and opinions, know that you might have a very different experience. Every week of the 6 weeks when Lynne teaches live, you will learn the science and the basics of intending and practice with randomly assigned classmates. [Advice] Don’t get frustrated or discourage if you can’t get the results like some. Just keep practicing, you need time to learn the skills and to accept and recognize that you, too, have those amazing abilities. I thought I didn’t learn much the first time through but now that I have done it a second time, I see I was building on my efforts back then. [Advice] If you are paired with someone you click with be sure to find a way to contact each other so you’d have a practice partner before the yearlong groups are assigned. Lynne creates a FB group for each year, usually that would be the place to search if you didn’t get a chance to exchange info during the class. For me, the yearlong group experiment is why the tuition is worth every penny. After the 6 lectures, Lynne and her team will do their best to assign 10-12 people into a group so there is a better chance of having 8 members making it to each meeting. Lynne will ask for a monthly report to check your progress until about 12 months after the first lecture. So if your group starts meeting quickly, you would get about 10 months. 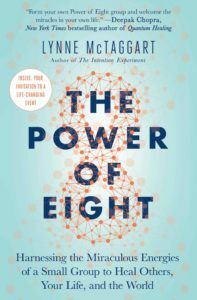 From Lynne’s experience, 8 works the best, you can learn more from her book The Power of Eight: Harnessing the Miraculous Energies of a Small Group to Heal Others, Your Life, and the World. My first time through the class, we were left with 3 people at the end, though we still saw some results, this group did not meet again after the year ended. It was a good thing though, I was not at a very good place mentally and physically. I needed a break after a year of not missing a single meeting. After making some life changes, I was slowly getting better. When Lynne’s early-bird offer came, I decided to try again. This time, I connected with a member soon after the group assignment. And before the first group meeting, two of us intended for a group with wonderful members to grow and learn with. And it worked! We were one of the groups that started regular meeting quickly. Even with privacy and technical concerns, everyone was gamed and did what one could to learn the secured social media and online meeting platforms. Our members are supportive, forward moving, kind, easy to work with, highly enlightened, intelligent, and humorous, I can go on for a while here. Every week, together, by intending and problem solving (adjusting the intention statements to be more effective), we bonded as a circle of love and light. I am proud to say we have pretty good results in helping ourselves and others this year. Thanks to my group mates, I am happier, more confident, and has regained most of the energy and health I used to have. And after years of asking for an answer, I figured out a firm new direction to go as a writer but without the stress and pressure I felt. Not all the results came directly from specific intentions but 100% brought to me by my group mates! With them, I can speak freely and not worry about sounding crazy or silly. It’s a great feeling to find this many like minded people and be with them every week. At the end of the year and there were still 7-8 participants every week. There were people who dropped off or switched earlier on but new members just fit right in. It is not a coincident who came to be in our group. [Advice] To get most out of the class, prepare to commit to attend the group meetings for the whole year. If you can’t do that and still want to try, perhaps Lynne’s live, in-person Intention Workshops would be a better choice. Having solid reasons for taking this class would keep you on track as you intend during the year. They are also a good way to track your progress. Not having any expectation about the class might bring you many unexpected gifts by not setting limits to what may come your way. You may experience technical/admin issues during the year, remember that Lynne and her team are dealing with a large group of people, know that they always try to provide us as best as they are able. Like me, most people find it hard to receive, through both of my groups, I leaned that receiving is also an important part of intending. Being a good receiver in general, it could be as simple as accepting a compliment with grace, allows you to sync up better with the receivers of your intentions which helps you deliver your gifts with better results. At the same time, there is a better chance for your own intention to manifest since you are better prepared to receive. Whether you end up taking the course or not, be like a Jedi, as I feel sometimes when practicing the art of intending, May The Force Be with You! Posted in I Learned This	| Tagged class experience, Intention Masterclass, Lynne McTaggart, power of 8, review	| Comment? Qi, even to most Chinese is a mysterious force that only kung-fu masters possess, much like the powers comic book superheroes have. In 2016, Prof. Si-Chen Lee (李嗣涔), published Scientific Qi Gong (科學氣功), explaining the science behind Qi Gong through his experiments, research, and personal journey. In kung-fu novels, Qi is often used to heal or to hurt people. With the help of Qi Gong Master Lee (李鳳山), showed that healing Qi increased DNA replication, harmful Qi slowed replication and even damaged some DNA chains in chromosomes. From his experiments, Prof. Lee thought that since Qi can affect other objects, Qi must be a fundamental force that exists everywhere like the gravity. 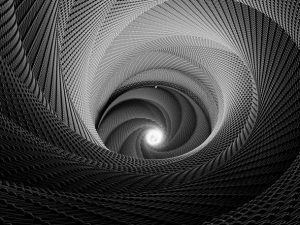 By chance, Prof. Lee learned about the Torsion Field, the twisting of space-time. He also proved this statment from his experiment by projecting a massy source energy through a crystal. He then concluded Qi is a torsion field. How Does Qi Gong Work? Prof. Lee suggests that Qi Gong activates Qi to adjust the body’s muscular system, smoothing out the body’s communication networks to allow the collagen protein to pass on the repair commands from the master gene to every cell before the next round of regeneration. Qi Gong ensures the commands are delivered without blockage thus promotes the body’s own self-healing ability. We don’t all have to become Qi Gong masters to benefit from Qi Gong. 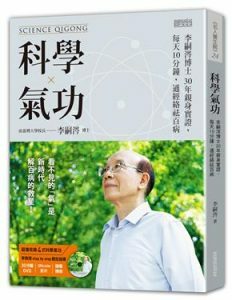 If you read Chinese and are interested in science and alternative healing, you would love this book. From this picture, you see mostly solid colors and no small clusters of stuff. This create the visual tidiness like folding with Konmari method. This Aqua metal 5-drawer cabinet was the seed of my vision. I’ve always wanted one, now I have a good reason. When I saw the actual color in The Container Store, sparks of joy flew. I’m still happy every time I see it! But I needed two to hold up the stereo and other things (unknown at this point), so I ordered one in yellow, a color I also like. I also joined their POP membership to save on possible future purchases. At the bottom I need something strong to support everything on top. After measuring, searching, and comparing, I ended up with BESTA shelving frame from IKEA. To be honest, I wasn’t so sure about the white but the other two colors just shout blah. Once I put it in, it actually brightened things up just the right amount. By the way, a few weeks after I bought it, it went on sale. Being an IKEA Family member gave me a 90-day price protection. And I got $8 back from my IKEA store. While waiting form my metal cabinets, I kept visiting The Container Store just for fun. By accident, I wondered to the clearance rack, saw a bit of yellow that matched the cabinet peaking out of an discountinued item for $13. When I opened it, it was a metal storage cube I had considered but thought it was too expensive. Right then, another part of the vision puzzle fell into place. I bought it then ordered a white one to help support the shelving plank above it. FYI, the doors and inside shelves come separately! 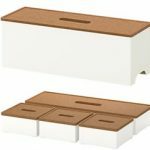 Free shelf covers! These are actually packaging lids for the 5-drawer metal cabinets. They are effective in hiding the “noisy” contents thought they don’t cover the whole opening. However, that’s what makes them easy to remove. I thought making something wider myself but none would look as nice. I’ve this arrangment for 3 months now and haven’t changed a thing. 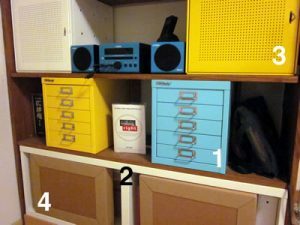 From the pictures, you can see that I wanted color inside the drawers. This way I get the burst of color joy only when I open the drawers, as I prefer visual tranquility most of the time. Looking inside drawer 2, you see the turquoise and white trays are lined. I used the color paper I have on hand to add vibrance and protection to the trays. I also carry the idea to other drawers. 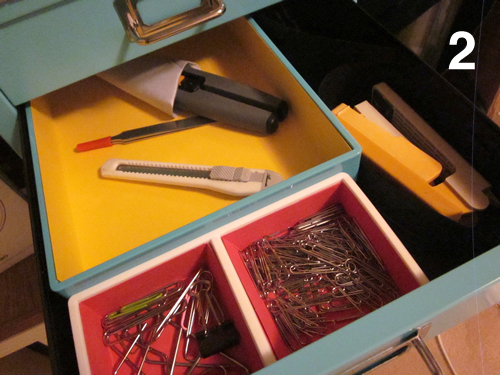 Each drawer, according to its contents get a different treatment. Keep in mind that I also made my own insert when I did not like anything fitting on the market. What makes me smile other then all the colors in my drawers? Everything is where they should be. Drawer 2 holds the most used items. I might have use drawer 1 but it doesn’t like to be opened all the way, even after I fixed the inside structure. And after months of using it, I realized drawer 2 is at the perfect height. So, as you put your items in order, remember your sprak will go away if it’s a pain to use. Do I have enough pens and pencils? Once you are Konmari Clean, you can save money and avoid new clutter. 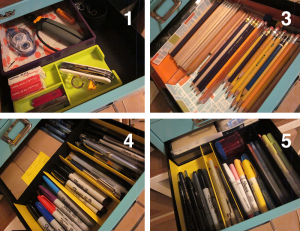 As you see in my drawers that it’s obvious that I don’t ever need to buy more pen and pencil. And that’s the whole point of working by categories. Keep these near where they were before? Is there another location that would be more efficient? How often will you use it? Think ease of access. Are these items where you might be looking if you don’t really remember exactly? One last thing, I do have a deal-with-it-later shelf but it’s obvious enough I won’t forget it and not prominent enough to bother me. Oh, one more last thing, less stuff = easier to clean = clean more often. I believe, as Marie promised, I don’t think I will ever clog up my space again. Posted in I Learned This, Tips for Daily Life	| Tagged KonMari method, Marie Kondo, organizing	| Comment? What’s the point of all the KonMari work? 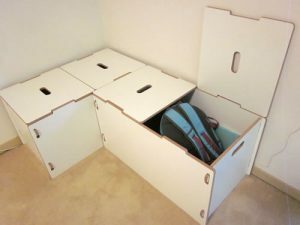 Why fold and store clothing Konmari way? I first tried folding things my way then her way, the difference–much lower visual noise. I was amazed how well visual tidiness brings tranquility to my life. I am more relaxed when I am in my room and in general. Then I applied the same principle to other categories. Must be able to hold heaver weight. The tiny stubs can’t hold much more than the shelf planks, not useful. Must hold all I kept after Konmari sorting–mostly items from this bookshelf and the meditation corner (formally the clutter blackhole). Must have colors that brings me joy. It was 5 months into the process, since I needed a break, I measured my shelf, armed with a tape measure, then visited various stores and web site for inspiration. Boy, that was fun and productive. Building this vision also pumped me up to finish the office supplies and smalls categories. Posted in I Learned This, Tips for Daily Life	| Tagged KonMari method, Marie Kondo, tranquility, visual noise	| Comment? If you read Marie’s first book, you know before you even sort a thing, you must envision the end result. Mine was simple–have a meditation corner in my room, perhaps with a comfy chair. And if I have the desire and energy, I will put up my own oversized Zentangle art in turquoise blue, black, and white. That vision powered me through to the end of the Konmari process. And trust me, this end vision is crucial to the process, even if the vision might change on the way, and the end result might be different. After 7 months of tidying up, I got my clean corner. Sorry, no before picture, all I cared at the time was getting rid of the corner clutter–dusty black metal shelves, an IKEA double hamper, and a bunch of this-might-com-in-handy-someday stuff. Trust me, no one needs to see that. Instead, I bought some yoga gears on sale to fulfill the vision of the meditation corner. One of the toy chests you see here holds those gears, the other holds my backpack and cloth I’ve already worn but not ready to wash. Once I put the lids down, no loose items, no visual noise. This works so much better for me than my original vision. Figure out the essence of your original vision. In my case, I just wanted my own quiet, uncluttered space. Be flexible and creative. Would following your original idea really spark joy? If not, look around, get ideas, change it. To suit my needs, I often find myself using/buying things that have different original purposes. Be okay to wait and buy what you need. Only after I knew what I need to make a new home for the items in each category, I start looking for their “home”, starting with what you already have. If that doesn’t spark any joy, then start searching to buy. 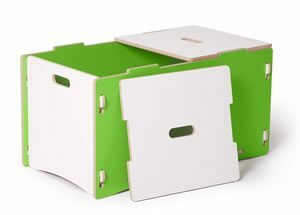 To save money, use the boxes and trays you are not using/recycling for organizing things that will be inside drawers or closets. The point is to have a clean visual environment. If you put it next to a wall, you can prop up the lid as if there were hinges. I used a plastic container (and I managed to sneak turquoise blue in there) to separate my backpack from my clothing since it’s more dirty. For assembly, it’s easier to have 2 people and a rubber mallet (I folded corrugated cardboard into a thick stack and used that with a regular hammer). And if you are a perfectionist, a level would be great, too. Once assemble correctly, they are very sturdy. The toy box come in many colors. Sprout uses safe and recycled material. 100% Made In USA, from design to manufacturing. They offer good variety of kid’s furniture. Posted in I Learned This, Tips for Daily Life	| Tagged KonMari method, made in USA, Marie Kondo, spark joy, toy chest	| Comment? After donating, recycling, and throwing away the rest of what I no longer need or love, I was surprised that I actually have shelves and drawers left empty. And I have to remind myself that empty spaces are the best medicine for my sanity. Now I’ve lived with my KonMari-ed room, I am proud to not pile things up again. One empty shelf is now the holding place for things to be give away, either going to friends or for donation. 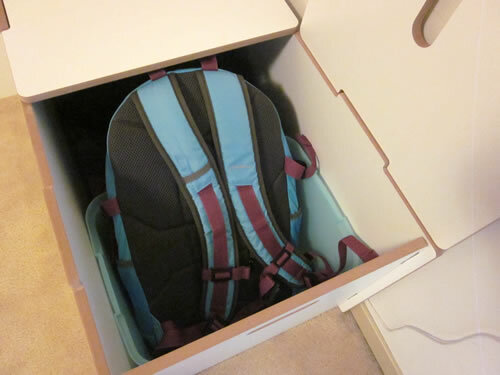 Instead of having to remove the lid, the new lid act as a hinged cover. It’s much easier to open and shut. No more holes in the lids for dust to get in the boxes. 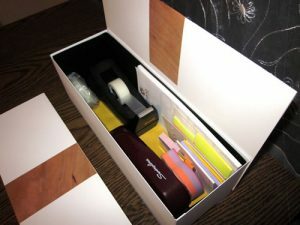 This process also helped me reduce my specialty paper collections. My collections are my sentimental items. I figured the more I used now, the less volume (i.e. pain) I would have parting with them. I had great fun making and designing the lids, therapeutic while productive, exactly how I roll. 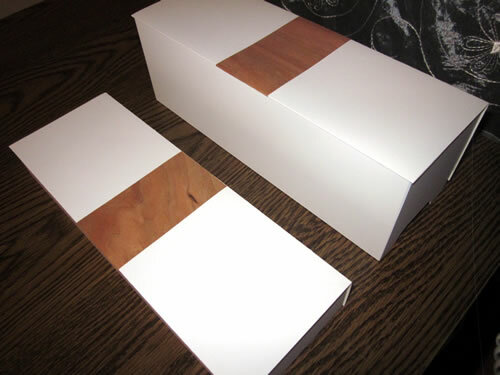 Since white dirties easily, I also made inserts to line the boxes. See the bright yellow poking out from the bottom of the black insert? Sparks joy everytime I raise the cover. You may not be a paper nut like me but try repurposing what you do collect. 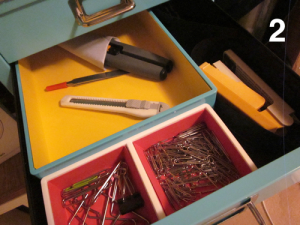 Marie did suggest to use what you have on hand to save money as you reorganize your items. You can’t buy read-made items to fit your every need anyway, why not make them your own? Posted in I Learned This, I Made This, Tips for Daily Life	| Tagged KonMari method, Marie Kondo, spark joy	| Comment? After a 3-month interruption, I am back on the KonMari Clean horse. Here are some updates and document cleanup tips. I have never been so thankful for the digital age. Though being an “old school” writer, I’ll never be without pen and paper, I love that I don’t have to keep a hardcopy of everything. Writers, don’t live in the piles of your drafts! According to Pam Binder of the Pacific Northwest Writers Association, you only need keep digital drafts and perhaps a hardcopy of the latest version. Remember to shred your old drafts, just to be safe. Sorting documents, what to keep? Most of what I had were old statements and were almost all shredded after I read through these articles. Since I can recycle shredded paper with residential garbage collection and I have a cross-cut shredder (strip-cut is not as secured), I decided to shred as I sort. I tried to mix different types of documents when I shred, cautious or paranoid? Could be both, ha ha! If you don’t have a shredder or you have a lot of confidential documents, look for free document shredding events in your area. Can you recycle shredded paper? Can photo paper be recycled with regular paper? In our area, you can recycle photos but only if they are shredded. Posted in I Learned This, Tips for Daily Life	| Tagged cleaning, clothes, documents, KonMari method, Marie Kondo	| Comment? n2n on Bandages, Not Made in USA? Jeremy on Bandages, Not Made in USA? As an Amazon Associate we earn from qualifying purchases. Depending on the specific content, most but not all product links on Needs to Note are directed to Amazon.com.